トップ > regular > Temet Nosce! This phrase is usually depicted with an exclamation mark, signifying it is a command, as if to know thyself is a simple declaration, and once you accept it, you will know yourself. It is an ancient wisdom established in the mystery schools well before Plato began to use it as a theme in his writings. What does it mean? What is thyself? This is the question that hovers over this philosophical expression like a ghostly mirage. Everyone understands what it is to know something. You have experienced it, seen it, interacted with it, and you have knowledge of it as a result. Thyself… that’s a little more precarious to pin down. That deals with the elusive consciousness—the part of us that is connected to something vaster than even our imaginations can conjure. Have you ever seen the handiwork of a lepidopterist (butterfly collector), who has pinned down a butterfly for display purposes within a glass box? 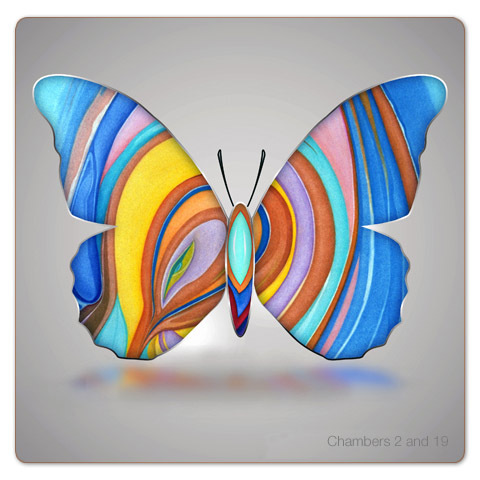 The butterfly is usually displayed with its wings wide open in order to display their best color and full scale. I remember seeing these as a child when I was about five years old. There were hundreds of butterflies at a museum in Barcelona. They were remarkable for many reasons, one of which was how often the open wings displayed features of an eye or multiple eyes. The patterns were there to dissuade prey—mostly birds—from thinking they were fragile, defenseless insects. I remember thinking that a butterfly couldn’t be that hard to catch, considering all of those butterflies had been caught by scientists, and I had seen my share of scientists, and none of them had looked particularly athletic. I remember studying those butterflies, all lined up, categorized, and pinned down like tiny Persian rugs. I made a decision that day to catch some of my own. Sparing you the details, I spent the better part of that weekend trying to catch butterflies in a flowered field only about three blocks from our home. By Sunday night, as the light faded from the day, I had one moth to my credit. Its wings appeared bruised at the ends, and its color was a cross between cinnamon and pale sand. No pattern. There was, to my dismay, nothing remarkable about it—apart from the fact that it was now my captive. Butterflies were much harder to catch than I had imagined. As docile as they looked underneath their glass display cases at the museum, they were amazingly elusive in the wild. And that’s really my point as we return to the axiom to know thyself. You can pin down the know part. You can even think you know the “thyself” part. However, this axiom is deeper than that. Just as the butterflies in the display cases seemed so knowable and representative of a butterfly’s essence—its color, shape, pattern, size and so on, the missing element was life. I couldn’t possibly know a butterfly by examining it in a box, yet that is how we often operate as “self-realized” individuals. We think we know ourselves. Our ego-personality laid out on display, all of the human traits recognizable, size, shape, intelligence, education, career, hair color, clothes, and a hundred other characteristics. Unfortunately, it isn’t that easy. Knowing what cannot be known is the paradox. Even the revered Greek philosophers understood that the axiom to know thyself! is the most difficult task a human being can grapple with. It wasn’t simply taking an inventory of one’s unique traits, personality, physical, emotional and mental qualities. There was something fundamentally more… and elusive. We are not the thinkers of our thoughts. Our thoughts arise from many sources, some of which have nothing whatsoever to do with our Self—that pre-quantum identity referred to as the Sovereign Integral. Thoughts arise from unconscious, subconscious, programmed consciousness and combinations therein. They can appear to be us, but thoughts actually arise as the artifacts and regurgitations of a programmed, consensual reality. The strata of layers that form thyself. What are the layers or dimensions that we are made of? The diagram below attempts to show the layers of the onion that comprise each of us. 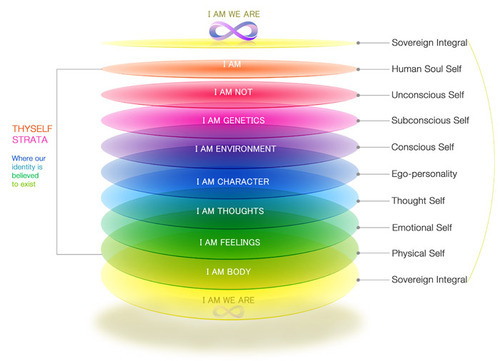 If you are in a human body, you possess each of these layers, and everyone will have an identity link to one layer stronger or weaker than another. Our linkages to these layers are, in part, what define our uniqueness. If someone has formed a particularly strong identity linkage to their Conscious Self, then they are probably inclined to think of “thyself” as the sum of their successes and failures. If they have strong linkages to their Human Soul Self, they are more inclined to think of “thyself” as a formless spiritual presence that is learning and evolving to become a teacher or master. If their linkages are most strongly with the Physical Self, they are more inclined to perceive “thyself” as the force that propels them to survive the hostilities of the world around them. No one has a single linkage. No one possesses all perfectly symmetrical linkages to the eight layers. No one has fixed linkages. The linkages are in flux, they operate situationally, they form attachments to layers that reflect where they focus their attention. When you see the axiom to Know Thyself! consider which layers you place your focus and attention on. Is there one in particular that you have formed a strong identity linkage? If you were to know thyself as that layer, or perhaps a combination of layers, is that even you? Maybe you are more like the butterfly caught in the wind’s play, and not pinned down beneath glass. Maybe you activate your imagination to stretch beyond the strata of the normally defined “thyself,” and in these brief, but profound moments, you touch into the Sovereign Integral consciousness. Thyself is infinite. It cannot be defined. To know it, is to know its shadow. For that which is truly you cannot be known, because knowing is facilitated by the mind, and the mind cannot comprehend this pre-quantum presence that dances beneath and above our sightlines and the arc of our human consciousness. It is better, perhaps, to form a new axiom. Let’s give it a phrase: Live as I AM WE ARE!